Presented below is a list of all our partners that we have cooperated with. We are proud to be associated with such distinguished marinas and we hope our cooperation continues for a long time to everyone’s pleasure. Satisfied customers have always been, and always will be, our primary business strategy and main focus. Founded over 50 years ago, Marina Punat is the oldest marina in Croatia. With 1,000 sea berths and roughly 400 dry berths, it is also one of the largest marinas in Croatia, and the numerous awards it has won over the years make it a top destination in Croatian nautical tourism. Marina Punat has been running on our marinacloud application since 2016 with great results. Marinacloud is integrated with all business and operational aspects of Marina Punat and since its launch, customers have repeatedly expressed their satisfaction with the options provided, primarily with the proactive care element. Once the greatest Croatian shipyard specialized for yacht service, Shipyard Punat has been running on the marinacloud software since 2016. Its special position and role in nautical tourism in the region has presented us with interesting challenges that we continue to tackle successfully. Located in Punat, adjacent to the aforementioned Marina Punat, Brodica is a dry marina with approximately 300 dry berths. We installed marinacloud in Brodica in 2016 and despite the unique requirements of an exclusively dry marina, our cooperation has been very successful. Founded almost 30 years ago on the northwestern coast of France, Port d’Armor is a well-known marina in nautical tourism all over the world, and with over 1,100 berths, it is a fairly large one as well. Our implementation of the Marinacloud software in Port d’Armor was successfully completed in at the start of May 2018, and we believe we will enjoy a a long and successful relationship with our French partners. Luka Volme is situated in the very south of the Istria peninsula in Croatia, roughly 5 kilometers south of the regional center Pula. It boasts roughly 250 berths – 200 of which are sea berths and 50 are dry berths. The marina has been operating on the marinacloud software since 2017 with great success. A new and ambitious Croatian marina, Marina Novi was founded in 2017 in the town of Novi Vinodolski in the northern Adriatic. It has over 200 berths, and since its founding, it has been running exclusively on our marinacloud software. We know that, with the help of marinacloud, Marina Novi will soon become a recognized name in our world of nautical tourism. Marina Vrsar is located on the beautiful western coast of the Istria peninsula in Croatia, concealed behind a unique archipelago just off the coast. The marina has roughly 400 sea berths, and we have successfully migrated the marina to our software in 2017. 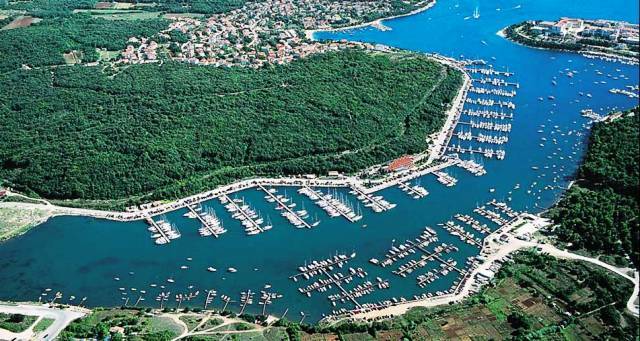 Closely connected with the aforementioned Marina Vrsar, Marina Funtana is also located on the western coast of Istria, just a few kilometers north of Marina Vrsar. Marina Funtana totals roughly 200 berths and, same as with Marina Vrsar, has been our partner since 2017. Located on the north-western coast of Istria (Croatia), Marina Nautica sits in a beautiful cove of the Novigrad bay. The beautiful seashell layout of the piers and berths is further complemented by the attractive Nautica hotel and wellness centre, making the marina a truly memorable sight. The marina boasts 365 sea berths and 50 dry berths. Located in the Veruda channel at the very tip of the Istrian peninsula, Marina Veruda is ideally placed for customers who want to explore the northern Adriatic at their own leisure. With well over 850 berths available for boats of all sizes and an idyllic landscape for a backdrop, it is one of the most notable marinas in the entire region. Marina Veruda is set to start using the Marinacloud and Proactive Boat Care systems in the first quarter of 2019. Located in the town of Mali Lošinj in Croatia, marina Mali Lošinj joined the Marinacloud family at the start of 2019 to our great mutual satisfaction. With well over 100 berths, Mali Lošinj has quickly become a key partner for us and we hope to have a long and fruitful collaboration. Marina Mali Lošinj is currently migrating to Marinacloud, this process is expected to be finalized in Q1 of 2019. While the Pičuljan brand is globally most often associated with the exquisite boats manufactured by this shipbuilding company, the marina run by this company has been locally known to provide a safe haven and superb repairs and maintenance for all boats. With well over 100 berths and a maintenance facility of the highest quality, it is no wonder more and more people flock to this marina every year. We are very proud of our partnership with Marina Pičuljan, and we expect to finalize the implementation of our Marinacloud and Proactive Boat Care systems in this marina by the end of Q1 of 2019. Marina Mitan is a new and promising marina in the Vinodolski Canal in Croatia. With 180 berths for boats up to 15 meters, 2 restaurants and a brand new crane, Marina Mitan is a bold new player in the marina sector. A great future partner that will grow alongside us, we are certain our partnership will be advantageous to everyone involved. Marina Mitan is currently migrating to Marinacloud.